If you’ve been following my instagram, you’ll see that I’ve been flexing my green fingers this year and growing some tomatoes. It’s gone well…a little too well as I’ve got rather a glut of tomatoes on my hands now. I’d say I’ve probably harvested about 3kg since August which is a lot!. 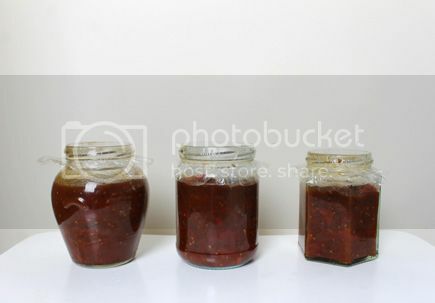 So as well as having copious amounts of home made tomato sauce I decided to make some delicious tomato and chilli jam which I’d made last Christmas and had gone down a storm. I’ll be handing these out again this Christmas as they make really nice home made gifts. 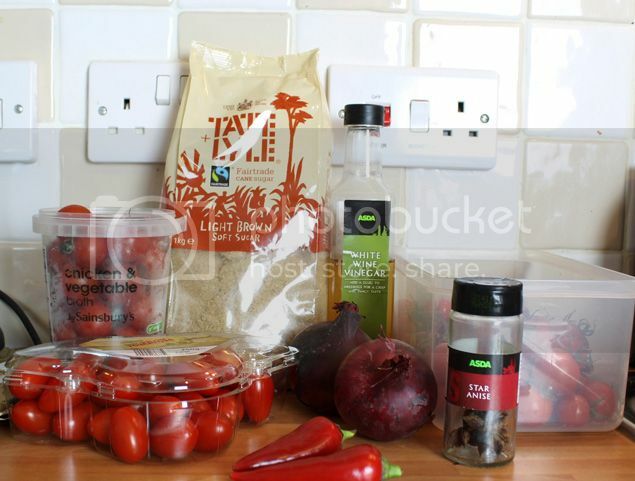 This recipe is adapted from the BBC website, I could have made my own version but this one is so good that I thought “if it ain’t broke don’t fix it”. I’ve used a bigger ratio of cherry tomatoes to plum, simply because of cherry tomatoes coming out of my ears, and I’ve omitted the ginger as, well I didn’t have any and it tastes pretty good without. This delicious tomato and chilli jam goes well with cold meats and cheese and makes a lovely home made gift. Preheat the oven to Gas Mark 3/160°C/140°C fan. Wash your jars in hot soapy water or stick them on a hot cycle of the dishwasher if you have one. Turn them upside down on a baking tray and put in the oven to dry for 10-15 minutes. 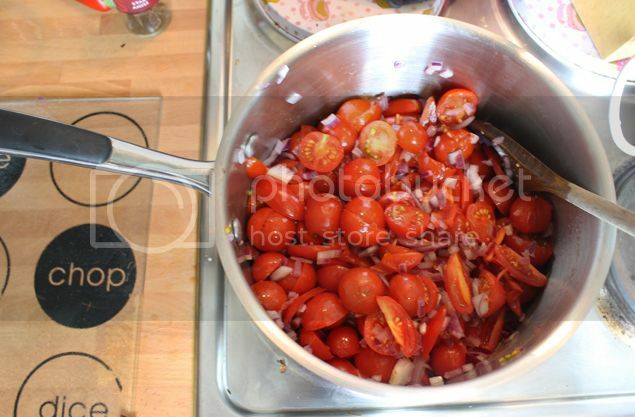 Finely chop the red onion and add to a large heavy saucepan. (I used a stainless steel one). Add the tomatoes and warm through on a very low heat. Add the chillies, star anise, sugar and vinegar, then bring to the boil and simmer for about 35 minutes or until very thick.